Our Mediterranean Group cruise participants recently enjoyed an incredible visit to Rome and the Vatican City. The day turned out to be one of the best highlights of the entire trip! 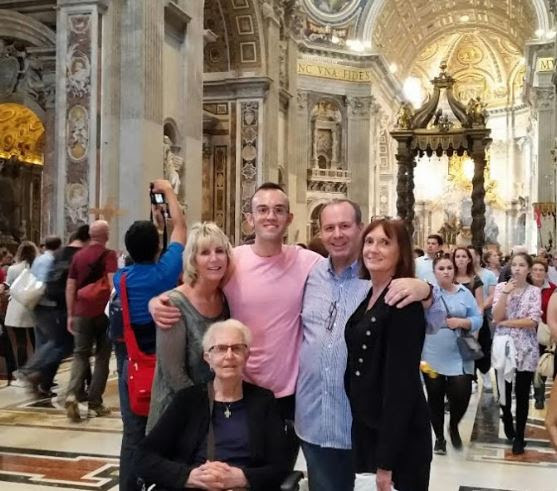 While visiting the Vatican City on your own can be overwhelming and challenging due to the size, large crowds and terrain of the area, the right amount of planning can make it possible to have an enjoyable and memorable experience. Outside the Vatican: The area outside the Vatican consists of narrow streets and busy traffic, and the main entrance to the Vatican Museums has moderate cobblestones thoughout. 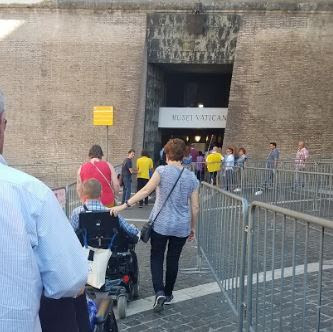 In order to make entering the building as easy as possible in a wheelchair, make sure to book your accessible guided tour with a company that has permission to park right outside the Vatican entrance. Avoiding Long Lines: Waiting in long lines does not only mean losing valuable time, it can also be very tiring. 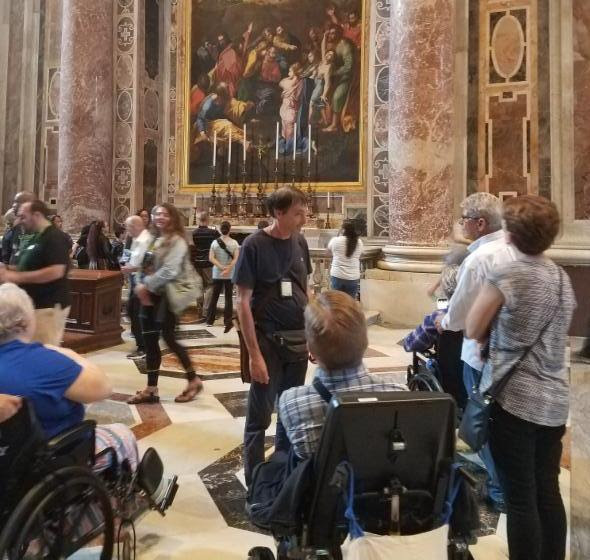 When you book your accessible guided tour of the Vatican City, make sure it includes skip-the-line tickets that will allow you to roll/stroll right through the special group entrance without waiting in line. Sometimes, during high season, regular visitors will have to wait for hours to get in. Elevators and ramps: Navigating the Vatican structures on your own can be quite confusing. 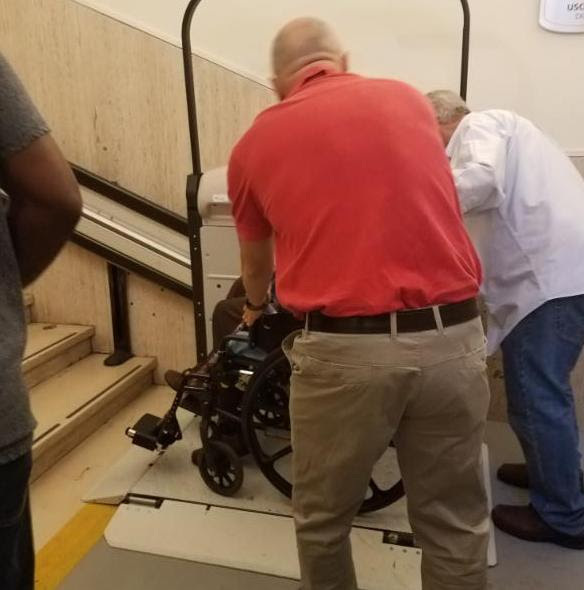 Elevators and ramps are available for complete step-free access, however, finding the best and shortest route is where it gets tricky. The best way to avoid this is by making sure that your tour guide is familiar with touring with disabled visitors and knows the “ins and outs” of the site. Access to the Sistine Chapel: To avoid the stairs leading down to the Sistine Chapel, a special lift is available. Please note, this lift allows you to enter via what is actually the exit. The hallway that follows the lift area is very narrow and your tour guide will need to stop the crowds from exiting in order for you to pass in the opposite direction. St. Peter’s Square Cobblestones: The Square itself is massive and incredibly beautiful. While there are cobblestones throughout, they are moderate and possible to navigate in a wheelchair. 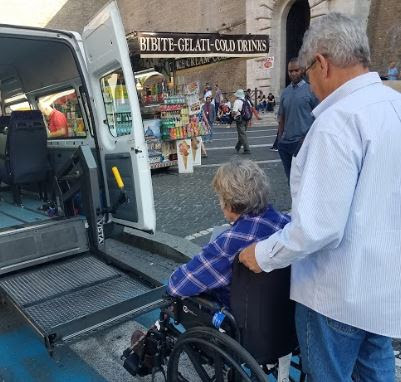 Disabled skip-the-line access to St. Peter’s Basilica: As with the Vatican Museums, disabled visitors can, if escorted by a tour guide with special permission, skip the up to hundreds of people waiting in line. You will still need to go through the security point but you will also have priority access here. St. Peter’s Basilica surfaces and entrance: The entrance to the Basilica is wheelchair friendly with a small ramp and otherwise flat access. The interior is wheelchair friendly with open and smooth areas that are easy to navigate. It’s not too early to start planning your accessible 2019 trip of a life time! Spend a week in Rome, or how about an extended vacation that includes Florence, Naples and other incredible Italian cities? We can help you with everything from accessible airport transfers, centrally located accessible hotels and memorable guided tours – all proven to be fully accessible! 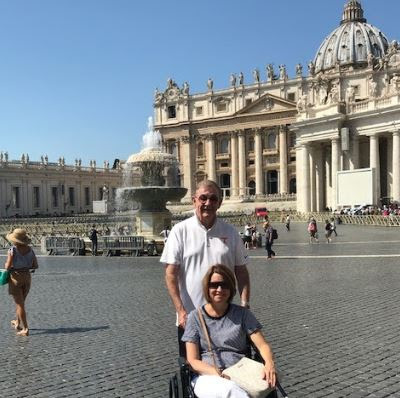 Contact Amy today to start making your accessible Italian dream vacation come true!